Taste that Makes the Morning! Coffee makers and Kettles are the most desired tool that we do need to brew a cup of tasty flavored coffee. As coffee does play an important role in every working class individual's lifestyle especially in the morning. so theres an unbeatable demand for these machines in the market. Some just love to taste it because of its sweet scent. And these appliances will bring you that aroma along with a perfectly brewed taste. Not for only personal satisfaction or taste. they are quite useful when you need to serve tea and coffee to your guests. Today. there are many renowned manufacturers who have started launching efficient coffee and tea making machines with helpful facilities and features. Some of these machines even have built in programmable options. Now, you can pre-program your coffee brews at the night and can get the fresh brewed coffee just the moment you wake up. In fact, the machines stick to consistency in results so that you can always get the perfect sip. They always serve the exact taste you are feeling thirst for! Isn't this amazing? More Types & Useful features! A wide range of variety is there once you make up your mind to bag one such appliance. And they are often full of features. So. before shopping you just have to chalk out your needs that you want to be fulfilled by these machines. In coffee makers. there three types- Pod. French Press and Drip. Similarly. 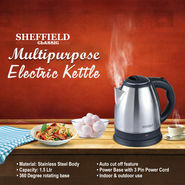 there are two different options available in the electric kettles category and they are - corded and cordless. In the case of kettles, the cordless ones are much easier to use and carry. Both of these machines offer specific temperature range. An auto shutoff feature is generally included in most of the models for further security while using. Every big appliance manufacturer understands these certain needs of the consumers and manufactures efficient machines. So, choosing the best one is no more a hard task.